How does one begin to describe a sunset or a rainbow? There are so many options, so many things to say, and yet the description, however lengthy or thorough, can only pale in comparison to the actual event. So it is in attempting to describe a Hudson Leick convention appearance. I have to say, I've read transcripts and descriptions of other Hudson Leick appearances and never really quite "got it". There seemed to be a gap between the words that I read and a visualization of the event. Now, however, after seeing Hudson Leick for the first time at a "live" convention, I *think* I finally "get it". Part of "getting it" is that I have been very fortunate to get to know a little about who she is beforehand. I did an interview with her for WHOOSH!, and in so doing, was able to speak to her on the phone a couple of times at some length. I also know people who know her, and can see a little of who she is through their eyes. But there is absolutely no substitute for seeing her in person. She loves the part she plays and there is no doubt about that. It must be satisfying to address a roomful of people and know you could get most of them to do absolutely *anything* you wanted them to do. Rightly or wrongly, I've come to the conclusion that at conventions, while speaking to an audience, Hudson Leick is still playing a part of sorts. She seems to hold back certain parts of herself while projecting others. Whatever the case, the effect is stunning, and those fortunate enough to attend a convention where she appears are going to get their dinar's worth. She appeared at Valley Forge in a clinging gold dress that was certainly *not* see-through, and had her hair done up carefully in a bun. The effect was rather "Dragon-Lady"-esque, and she was certainly in command as she greeted the audience with her trademark and seemingly indifferent "Well, I'm here." She commented that her parents were in the audience, and if we could find them, we could ask them "anything you want." She told us, quite in character, as Callisto might say it in an exaggerated and sarcastic way, "They *love* people." The audience loved it, as they did many of her remarks, and laughed knowingly, since they "got it" as well. She asked if we were having fun. Someone from the audience yelled the question "Are you having fun?" She got that familiar, mischievous twinkle in her eye and responded "I'm *always* having fun!" Commenting on her clingy dress, she said that her mother (who apparently still calls her Heidi) told her not to wear anything see-through because her father was coming. "So," she declared after noting her dress kept riding up on her, "I wore this!" Again, the audience signaled their approval. At one point while she walked back and forth across the stage to let all sides get a look and picture (and she was very considerate to do this because during the Q&A session, all the questions came from one side of the stage only and much of the audience could only see her from the back) the microphone cord got caught and pushed up her skirt from between her legs. Flashbulbs popped. "You know *that's* goin' on the Internet," she commented, to wild applause. She said to the audience "Why don't you all scream for me?" and there was instant and deafening response. "THAT," she smiled, "was LOVELY." The first question came from a little girl. "When you're in character, how come you're always so mean to Xena?" The audience roared with laughter at that. "Well," Hudson answered, "Callisto has a couple problems." Big audience response. "She actually *likes* Xena." Pause. "That's not enough, huh." Short pause. "She's bad, she's just a bad guy." "But *why*?" the little girl persisted. "Honey, I don't know!" Hudson smiled. "Ask the writers, I'm just the actress!" "And how about a sidekick," the little girl went on. "You don't have a sidekick." The audience roared again, liking the precocious little girl. "I don't *need* a sidekick," Hudson put her hands on her hips in mock indignation. "I'll be your sidekick!" someone from the audience called out. "I *bet* you will," Hudson smiled wickedly. Another person at the mike compared Hudson to Ida Lupino in acting style. After another question she complained briefly about her high heels making her uncomfortable. Someone yelled "Take them off!" "No," she replied in a gun-moll accent. "I don't wanna take 'em off. It makes me feel awl mature and classy with 'em on." She went back to normal voice and said "I'm showing off to my parents now. Look mommy, I'm on stage and wearing heels and I'm a grownup now! And all these strange people are watching me 'cause I'm on TV and I carry a sword!" She says the final line with quite a twinkle in her eye. "Aren't you proud?" The audience showed their approval with more applause. Someone asked if she did her own stunts and she said she does the fight scenes but not the flips or equestrian stunts. She added that sometimes men are dressed up as Callisto to do scenes "to scoop up Gabrielle." She points to her arm. "These arms aren't gonna be scoopin' up Gabrielle." More audience approval. "Not that I wouldn't give it a go!" More laughter and applause. There were numerous requests for hugs, which Hudson cheerfully granted. In response to one question, Hudson said she has three more XENA's to do. I believe from other sources that the one she will shortly go down to film is THE BITTER SUITE, but that means there are two more after that we hadn't heard about until now! MATERNAL INSTINCTS doesn't count because that's already done and in the can, ready to be shown in just a few weeks. As to future non-Xena work, Hudson mentioned that she has new representation and is going out on a lot of auditions (we talked about that in some detail in the WHOOSH! interview you will be able to read in November). One person asked how she liked playing a psychopath, to which Hudson innocently responded "What do you mean?" The audience roared approval. She then explained how the role of Callisto is an outlet for her and that she enjoys it very much. The questioner followed up by asking if she enjoyed doing it as much as it appears. "Hell yes!" was the response, and more cheers followed. Another questioner sought dating advice -- does Callisto believe in kissing (or was it hissing) on the first date. Hudson (thinking like Callisto) said you have to show them who is boss. "Kissing is fine as long as you take them and they don't take you." She paused and got a very thoughtful look on her face and said "Yes, *you* must always hunt *them*. You must decide who you're going to get, and then... get 'em." 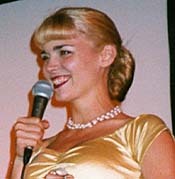 Hudson was surprised that she got hired for her TOUCHED BY AN ANGEL role after the people responsible for that show saw a tape of her in her HIJACKED role as a psycho hijacker. They in fact used that to determine she was a good enough actress for that role, even though it was a very different kind of part. She did the famous "Callisto scream" without microphone and with. The crowd went nuts. Even without the microphone it was very loud and clear. "I can't believe I get paid for this," she smiled afterwards. "It's a dream job!" She confirmed for the billionth time that her name is pronounced "like", not "leek". While she sipped a little from a small bottle of water some of the crowd chanted "Chug, chug, chug, chug!" She laughed, as did the audience. Someone asked what she wanted to do in future, and she responded that the liked television but also would like to do films. She wasn't keen on doing soaps, but one never knows. Basically, she just wanted to work right now. She was asked, and many have wondered, if Callisto would "turn good". Hudson shook her head and asked "Would you want a 'good' Callisto?" The audience loudly answered in the negative. Hudson then said that in her opinion Callisto probably wouldn't turn good, but she also added that sort of thing is ultimately up to the writers. She speculated that if Callisto did turn good, we wouldn't see much more of her. Hudson was asked when her next episode [MATERNAL INSTINCTS] would air, and she said probably around Christmas-time, and it was a really dark one. She sounded very proud of it, but when asked for details, like "Who dies?" she responded "I'm not saaaayyyyyyiiiiing!" She said that there will be a singing Callisto [reference to the upcoming BITTER SUITE] and "You do *not* want to hear me sing." The crowd begged to differ. One of the con staff loaned her a sword and she posed a little with it. In response to audience prompting, and to massive audience approval, she recited the famous lines "Here comes trouble!" and "Why can't you just *die* like a good boy!" She told a cute little story about what happened when she was in the HERCULES episode SURPRISE with Kevin Sorbo. It was apparently her idea to kiss him before she whacked him a good one in a particular scene. She asked Kevin "Can I kiss you?" He answered "With tongue?" She said "No, not with the tongue." That was it! Hudson commented she loved the "campfire" scene between her and Renee in A NECESSARY EVIL. She said she laughed out loud the first time she read that scene and she complimented Renee on doing a great job with it. And a couple of questions later, it was time for Hudson to leave the stage. After the autograph session, she stayed until the bitter end, and everyone who hung around and wanted a picture taken with her had the chance. She was very generous with her time, and is truly a special person. The Xenaverse is lucky to have her.